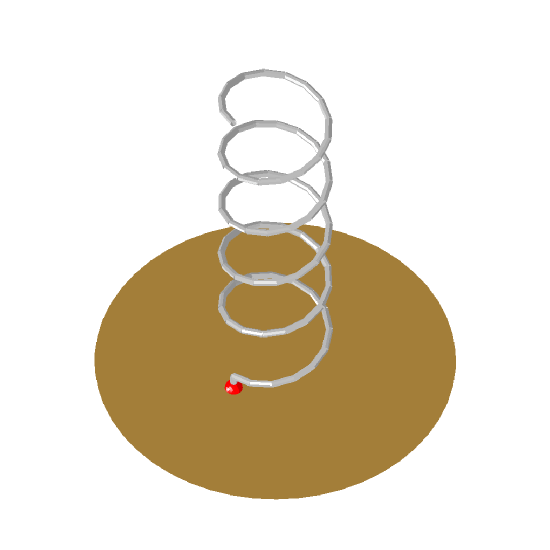 Image of the Axial-mode wire helix. This moderately wide-band, circularly polarised antenna is used when gain between about 11 and 19 dBi is required. Its relatively small cross-section makes it popular at UHF and microwave frequencies and it has even been used in the HF band. It is widely used for satellite communications and numerous other applications. A helix wound like a right-hand screw transmits and receives right-hand circular polarisation [Kraus, J.D. and King, H. E.]. There are two principal modes of operation, namely broadside and end-fire (axial). The end-fire mode is typically used because it can achieve circular polarisation over a wider bandwidth and has a single major lobe. 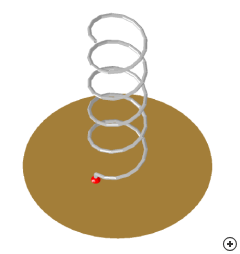 The basic concepts of the axial-mode helix antenna were established by John Kraus in 1947. Axial mode operation takes place when the helix circumference is of the order of a free-space wavelength and currents at opposite sides of the helix are out of phase, thus radiating in-phase in the axial direction. The pitch angle is usually 12 – 14°. The ground plane should be at least 0.75λ in diameter. This often takes the form of a circular cylindrical cup or cone, which serves to reduce the back radiation and enhance the forward gain. Helices with few turns perform well over a fairly wide band, with a bandwidth ratio of around 1.8:1. However, long helices have a reduced upper operating frequency. Varying the diameter of the helix can be used to widen the bandwidth and improve radiation characteristics, e.g. adding an extra two-turn end taper at the end of the helix can reduce |S11| over a wide frequency band and improve the axial ratio. This can also be achieved without increasing the length of the antenna by the use of a planar terminating Archimedes spiral of about 2 turns [Baker, D.E. ].